Click on this thumbnail image to enlarge, then right click to save ! The Talbo chassis is constructed of 11 gage steel which is laser cut using our CAD files. The pieces are formed and fixtured and welded to form the tubular perimeter chassis seen above. 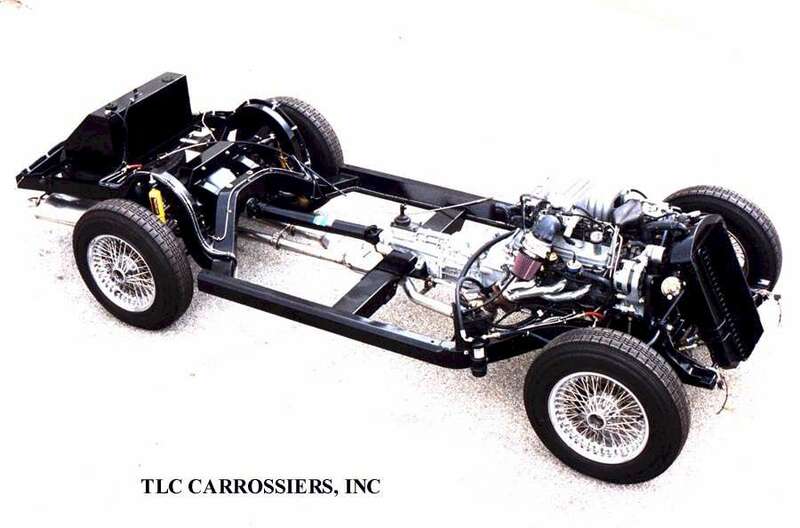 The chassis is fully painted and the inside is coated with a waxyoil rust preventative. Suspension is all independent with passive steer toe links on the rear. Brakes are disks both front and rear with 4 piston calipers on the front. Steering is rack and pinion. The exhaust system is all stainless steel using 4 catalytic converters and Borla mufflers. Wheels are 16 inch Dayton wires with stainless steel spokes. Tires are Michelin 215-65-16 MX4. The body is fiberglass composite using premium high heat distortion resin. The body mounting to the chassis is through rubber isolation biscuits. Paint is the highest quality urethane by Glasurit applied in our down draft booth. The body is sound deadened and undercoated. All exterior trim is stainless steel hand formed and polished in our shop. The headlights are automatically raised when illuminated. The fender skirts are removed with one fastener. The spare tire is mounted on a swing down rack under the rear deck. The interior accommodates a six-foot plus man comfortably with room to spare. Seats are leather covered buckets, 6 way power adjustable, made specially for the Talbo and very comfortable. The dash is either leather covered or engine turned stainless steel. Instrument gage faces are custom made to emulate the original French style. The wood trim is Honduras Mahogany carved here at TLC Carrossiers. Of course there is Air conditioning and heat, a remote alarm system, remote door locking, power windows, and a stereo CD sound system. There is storage space behind the seats for luggage. Performance and ride is that of a modern GT car. Acceleration from 0 to 60 mph is 6.0 seconds.